Lung abscess is a well-circumscribed and localized suppurative lesion in the lung parenchyma as a result of pyogenic microorganisms, which usually leads to tissue necrosis and cavitation. The lung abscess radiologically appears as an air-fluid level and despite the antibiotic treatments, up to 10%-15% of these lesions do not heal. In these cases, drainage by the transthoracic catheters and aspiration by the guidance of bronchoscopy or computed tomography and surgical resection are the choices of treatment modalities. Herein, we report a 70-year-old female patient with diabetes mellitus. A lung abscess was detected in the right lower lobe with peripheral localization. The patient did not recover by medical therapy and the content of abscess was aspirated by ultrasonography guidance. 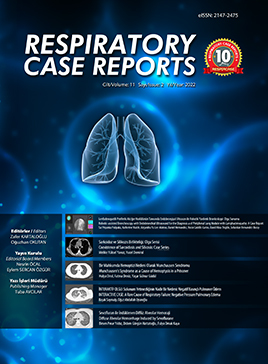 No cases with lung abscess that was treated completely with the fine needle aspiration by the guidance of ultrasonography were found in the literature. As a result, we recommend that transthoracic drainage of peripheral lung abscesses by the guidance of ultrasonography should be considered as a first choice treatment modality with the advantages of being affordable, convenient, and with no exposure to radiation.